Fleet - ​Helicopter Flight Training Inc. The Robinson R22 is flown throughout the world for many applications, ranging from flight training to livestock mustering to patrolling pipelines that require dependability, low operating costs, and performance. 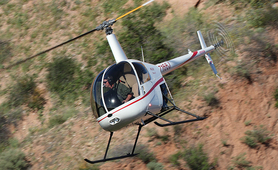 The R22 incorporates a Lycoming four-cylinder, carburetor-equipped engine fueled with 100L grade aviation gasoline. The engine is derated to 131 hp for five minutes at takeoff and 124 hp for continuous operation. A powerful engine, a lightweight steel-tube airframe, and aerodynamic shape gives the R22 a cruise speed of up to 90 kts and an average fuel consumption of only 7-10 gallons per hour. R44 helicopters are high performing, reliable, and easy to maintain. 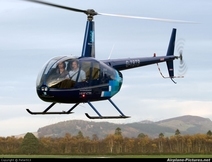 R44s have a two-bladed rotor system, T-bar cyclic, and 1+ 3 cabin configuration with unobstructed views from every seat. A lightweight air frame and aerodynamic fuselage optimize airspeed and fuel economy. The helicopters’ low tail-rotor tip speed, heavy-duty muffler, and large cambered tail reduce flyover noise. R44 helicopters feature the latest in Robinson technology including lighter weight landing gear.